Blog Are you always so stupid or is today a special occasion? Moheb Doss, I’m really impressed, I’ve never met such a small mind inside such a big head before! 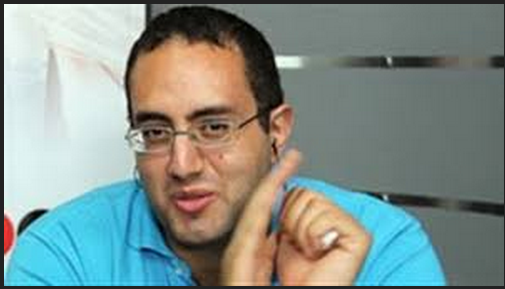 Moheb Doss who is no longer a member of Tamarod campaign and he was One of the five founders of Tamarod Campaign, the movement that led to protests and overthrew Muslim Brotherhood Regime, claimed on 15/4/2014 BF, that his movement was taking orders from the Army. He also claimed that they were naive and were not responsible, and after the military gave 48 hours to Muslim Brotherhood regime to solve political problems diplomatically and peacefully, the poor thing realized that they were being used by the army. He also said that what 30/6 have led to, including Sisi’s candidacy for presidential elections, was not one of the campaign’s goals. The question is: Why now did you volunteer to speak about this issue? Were you stupid and a big moron all this time, and only on 15/4/2014, you realized that what you have in your head was a brain and not a watermelon?! I’ll tell you why. Because you had expectations and you didn’t get any! You did not start a rebel campaign to participate in saving your own country from fascism and terrorism, but to jump on others shoulders to steal a piece of the big cake and run away with it, but unfortunately, your head got bigger and your mind got smaller! Who gave you the right to speak about the Egyptian people’s revolution and to talk on their behalf like this revolution was one of the properties you inherited from your ancestors? or like Egyptians are orphanages and retards and you are the one who will enlighten their path!? Mr. Moheb, if you are telling the truth, you don’t have to remember anything, but when you are telling lies, you need to have a very good memory! Then, a rare disease damaged Mr. Moheb’s brain after 5/10/2013, and it developed seriously on 26/10/2013. Elshaab newspaper published a video and an article of Moheb Doss dated 26/10/2013. Moheb Doss accused his friends and colleagues in Tamarod campaign of taking money and bribes, from where, from who and how? he didn’t mention. He just accused them. He also mentioned that his colleagues received millions of pounds in their banks accounts from corrupted businessmen to switch the goals of the campaign, but he didn’t for instance go to the DA office and presented any official statements or documents to support his serious accusations against his colleagues. Moheb Doss was pissed off that he was not chosen among other Tamard members campaign to represent the movement in the amendment of the 2014 constitution before the vote on the referendum. Moheb Doss had many chances to speak-up and tell this boring story of his, long time before April 2014, but he didn’t. I don’t understand this. Mr. Big Head, why you kept your mouth shut all this time, and just now you decided to speak-up? Don’t tell me, I know. The Armed forces kidnapped you and forced you to drink something yellow and threatened you if you ever speak-up, they could make a monkey out of you, but they are not going to take all the credit! There is nothing easier than ruining others reputations, just by spreading the word. The law doesn’t admit words or claims to investigate with a defendant. The law depends on evidences and not Bla Bla bla accusations and cheap talking. The 30th of June revolution succeeded for two reasons only, because millions of Egyptians took the streets against Muslim Brothers. If Tamarod campaign think that the petition they have gathered from Egyptians against Muslim Brothers were going to change anything, even if they managed then to gather millions of forms, they are totally mistaken. The other reason is that the military responded positively to people’s demand and prevented the country from a civil war. We, the Egyptian people who took the streets with our own free will, no one bribed us or forced us to protest against Muslim Brotherhood. No one gave us orders to revolt against Muslim Brotherhood. Tamarud was just a drop in the ocean and not the whole ocean which exploded in the face of the Brotherhood. 30/6 was the Egyptian people’s revolution and not Tamarod’s revolution, it was the will of people and not the will of a group of rebels. Now you realized that you were naive? You are certainly naive and stupid, because no one can force Egyptians to do anything if they don’t want to, not even Sisi himself. You are also stupid, because it is the street that is miles ahead of Tamarod, miles ahead of all crippled oppositions parties and elites who don’t have any popularity or influence in the Egyptian street. 30/6 is our revolution and not yours or the army’s revolution, keep talking moron, maybe one day you will surprise us and say something intelligent! 30/6 happened because we “The Egyptian people” wanted it to happen and not because it was planned like you claimed. Keep challenging our will, keep spreading lies, you won’t achieve anything but our despise to people like you, who attack their country in a very critical period, while we are fighting terrorism, because you work for someone else’s agenda. You see, I never judge people based on what I think, I judge them based on their acts and what they declare from their own mouth. Moheb Doss, you are one of those Egyptians who use English language in addressing their messages and letters to the west, instead of speaking Arabic mother tongue language and addressing your speech to your own people, Because you are totally aware that people in Egypt consider boys like you can be used as a blueprint to build an idiot. And Mr. Moheb, I know you are nobody’s fool, but I’ll seriously remember you in my prayers, maybe someone will adopt you one day!